Today we go with the second contribution by one of my favourite perfumistos around: Mr Sugandaraja. For further informations on the author you migh want to check his previous article here. I'm of the school of thought that when it comes to irises, there are two kinds: Iris Silver Mist, and everything else. Leaving his rooty majesty aside, the soft powdery accord familiar in a hundred fragrances ( and to a hundred-thousand noses through releases like Dior Homme ) is here tooled into the form of a blooming iris that's suede to the touch. While, from what I understand, Parfum d'Empire was dragging out some hoary orientalist association with the late Turkish empire ( "Ottoman Leather" ), my English mind can't help but keep the word order intact and read it as a Leather Ottoman in the sense of being a small, upholstered foot-rest ( ottoman's other English meaning ), which it aptly resembles in mellowness. I can easily picture myself in full Romantic pipe-dream repose, feet up on an ottoman, smelling of Cuir Ottoman, and listening to a languorous work like this one. In esse, that's what Cuir Ottoman is about for me: comfort. Leather is typically either a challenging note, or more commonly, not leather at all. Here a true new-shoe leather is supported by an enormous violet-iris accord ( placed between orris butter and violet candy ), a smooth balsamic facet, and a dark, fleshy jasmine that stays well in the background. No notes ever appear or disappear to my nose, its richness compensating for the static development. Throughout it has a certain chilled vaporous quality somewhere between Sarrasins and Caron's Pois de Senteur. I'm not usually one to venture into the much vexed-about topic of fragrance and gender, but I will say this: if Cuir Ottoman was human, it would be Emma Peel in the leather cat suit, I'm quite sure. Take that as you will. yum, yum and supper yum (both emma peel and cuir ottoman). 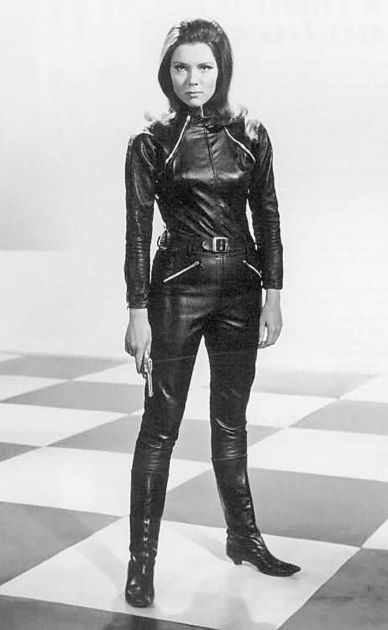 would you say a slightly tipsy emma peel (and hopefully horny as well)? love them.